One of the most detailed 3-D mapping apps on the iPhone is UpNext, which lets you click on 3-D buildings and see a list of the businesses and offices inside. Up until now, however, it only covered New York City. A new update adds three new cities: Boston, Washington, D.C., and Austin (just in time for SXSW, of course). 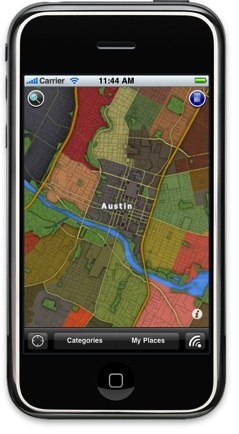 The Austin map won’t be available until later tonight, where it will appear in the app’s city selection screen. UpNext lets you zoom around the city in a very Google Earth-like fashion, search for restaurants, bars, and stores. You can favorite and bookmark different venues, see Citysearch and Yelp reviews, and broadcast a tip about the place through Facebook or Twitter. UpNext now pulls in local listings data (addresses, phone numbers, reviews,menus, websites, photos) from CityGrid, Citysearch’s local content and advertising network. And what would an Austin update be without Foursquare integration. Once you log into Foursquare through UpNext you can see where all your friends are checking in. 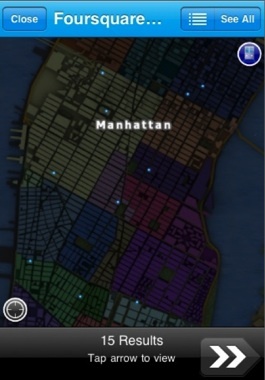 The checkins are overlayed as glowing blue dots on the map.